Bridging the gaps between siloed content and its various repositories is one of the biggest challenges in information management today. Many organizations store content in aging and disparate repositories, shared drives, mobile devices, and removable storage media, creating an administration and maintenance nightmare. Thus, the unnecessarily challenging process of finding content begins. 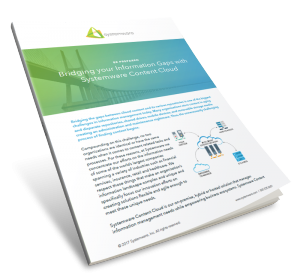 In the product sheet, discover how Systemware Content Cloud can “connect the dots” of your information silos whether across firewalls or systems to empower people and enterprises with the information at the right time and in the right context.